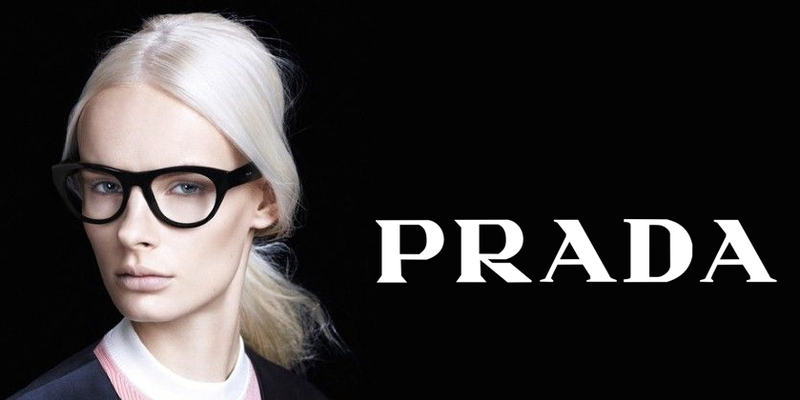 Prada eyeglasses are offered in over 300 styles to satisfy every fashion demand. Prada is one of the most established Italian designers take glasses accessory very seriously and incorporating it into run way shows and print advertisement. Prada eyeglasses are very popular among men and woman of all ages. Prada glasses look classic and timeless, and many designs have couture styles to cater to fashion forward public. Buy Prada VPR 08VF glasses online at a friendly price. Originally made in 2018, Prada PR 08VVF are lightweight plastic frames. Each pair of authentic Prada glasses ships worldwide with authenticity certificate, Prada box, case and a cleaning cloth. Buy Prada VPR 16S glasses online at a friendly price. Originally made in 2018, Prada PR 16SV are lightweight plastic frames. Each pair of authentic Prada glasses ships worldwide with authenticity certificate, Prada box, case and a cleaning cloth. Buy Prada VPR 10VF glasses online at a friendly price. Originally made in 2018, Prada PR 10VVF are lightweight plastic frames. Each pair of authentic Prada glasses ships worldwide with authenticity certificate, Prada box, case and a cleaning cloth. Buy Prada VPR 10V glasses online at a friendly price. Originally made in 2018, Prada PR 10VV are lightweight plastic frames. Each pair of authentic Prada glasses ships worldwide with authenticity certificate, Prada box, case and a cleaning cloth. Buy Prada VPR 09VF glasses online at a friendly price. Originally made in 2018, Prada PR 09VVF are lightweight plastic frames. Each pair of authentic Prada glasses ships worldwide with authenticity certificate, Prada box, case and a cleaning cloth. Buy Prada VPR 09V glasses online at a friendly price. Originally made in 2018, Prada PR 09VV are lightweight plastic frames. Each pair of authentic Prada glasses ships worldwide with authenticity certificate, Prada box, case and a cleaning cloth. Buy Prada VPR 08V glasses online at a friendly price. Originally made in 2018, Prada PR 08VV are lightweight plastic frames. Each pair of authentic Prada glasses ships worldwide with authenticity certificate, Prada box, case and a cleaning cloth. Buy Prada VPR 07VF glasses online at a friendly price. Originally made in 2018, Prada PR 07VVF are lightweight plastic frames. Each pair of authentic Prada glasses ships worldwide with authenticity certificate, Prada box, case and a cleaning cloth. Buy Prada VPR 07V glasses online at a friendly price. Originally made in 2018, Prada PR 07VV are lightweight plastic frames. Each pair of authentic Prada glasses ships worldwide with authenticity certificate, Prada box, case and a cleaning cloth. Buy Prada VPR 62U glasses online at a friendly price. Originally made in 2018, Prada PR 62UV are lightweight metal frames. Each pair of authentic Prada glasses ships worldwide with authenticity certificate, Prada box, case and a cleaning cloth. Buy Prada VPR 50S glasses online at a friendly price. Originally made in 2018, Prada PR 50SV are lightweight metal frames. Each pair of authentic Prada glasses ships worldwide with authenticity certificate, Prada box, case and a cleaning cloth. Buy Prada VPR 16MA glasses online at a friendly price. Originally made in 2018, Prada PR 16MVA are lightweight plastic frames. Each pair of authentic Prada glasses ships worldwide with authenticity certificate, Prada box, case and a cleaning cloth. Buy Prada VPR 13UF glasses online at a friendly price. Originally made in 2018, Prada PR 13UVF are lightweight plastic frames. Each pair of authentic Prada glasses ships worldwide with authenticity certificate, Prada box, case and a cleaning cloth. Buy Prada VPR 05V glasses online at a friendly price. Originally made in 2018, Prada PR 05VV are lightweight plastic frames. Each pair of authentic Prada glasses ships worldwide with authenticity certificate, Prada box, case and a cleaning cloth. Buy Prada VPR 04V glasses online at a friendly price. Originally made in 2018, Prada PR 04VV are lightweight plastic frames. Each pair of authentic Prada glasses ships worldwide with authenticity certificate, Prada box, case and a cleaning cloth. Buy Prada VPR 03VF glasses online at a friendly price. Originally made in 2018, Prada PR 03VVF are lightweight plastic frames. Each pair of authentic Prada glasses ships worldwide with authenticity certificate, Prada box, case and a cleaning cloth. Buy Prada VPR 03V glasses online at a friendly price. Originally made in 2018, Prada PR 03VV are lightweight plastic frames. Each pair of authentic Prada glasses ships worldwide with authenticity certificate, Prada box, case and a cleaning cloth. Buy Prada VPR 03S glasses online at a friendly price. Originally made in 2018, Prada PR 03SV are lightweight plastic frames. Each pair of authentic Prada glasses ships worldwide with authenticity certificate, Prada box, case and a cleaning cloth. Buy Prada VPR 02V glasses online at a friendly price. Originally made in 2018, Prada PR 02VV are lightweight plastic frames. Each pair of authentic Prada glasses ships worldwide with authenticity certificate, Prada box, case and a cleaning cloth. Buy Prada VPR 01VF glasses online at a friendly price. Originally made in 2018, Prada PR 01VVF are lightweight plastic frames. Each pair of authentic Prada glasses ships worldwide with authenticity certificate, Prada box, case and a cleaning cloth. Buy Prada VPR 01V glasses online at a friendly price. Originally made in 2018, Prada PR 01VV are lightweight plastic frames. Each pair of authentic Prada glasses ships worldwide with authenticity certificate, Prada box, case and a cleaning cloth. Buy Prada VPR 63U glasses online at a friendly price. Originally made in 2018, Prada PR 63UV are lightweight metal frames. Each pair of authentic Prada glasses ships worldwide with authenticity certificate, Prada box, case and a cleaning cloth. Buy Prada VPR 16UF glasses online at a friendly price. Originally made in 2018, Prada PR 16UVF are lightweight plastic frames. Each pair of authentic Prada glasses ships worldwide with authenticity certificate, Prada box, case and a cleaning cloth. Buy Prada VPR 16U glasses online at a friendly price. Originally made in 2018, Prada PR 16UV are lightweight plastic frames. Each pair of authentic Prada glasses ships worldwide with authenticity certificate, Prada box, case and a cleaning cloth. Buy Prada VPR 15U glasses online at a friendly price. Originally made in 2018, Prada PR 15UV are lightweight plastic frames. Each pair of authentic Prada glasses ships worldwide with authenticity certificate, Prada box, case and a cleaning cloth. Buy Prada VPR 14U glasses online at a friendly price. Originally made in 2018, Prada PR 14UV are lightweight plastic frames. Each pair of authentic Prada glasses ships worldwide with authenticity certificate, Prada box, case and a cleaning cloth. Buy Prada VPR 03Q glasses online at a friendly price. Originally made in 2018, Prada PR 03QV are lightweight plastic frames. Each pair of authentic Prada glasses ships worldwide with authenticity certificate, Prada box, case and a cleaning cloth. Buy Prada VPR 60U glasses online at a friendly price. Originally made in 2017, Prada PR 60UV are lightweight metal frames. Each pair of authentic Prada glasses ships worldwide with authenticity certificate, Prada box, case and a cleaning cloth. Buy Prada VPR 57U glasses online at a friendly price. Originally made in 2017, Prada PR 57UV are lightweight metal frames. Each pair of authentic Prada glasses ships worldwide with authenticity certificate, Prada box, case and a cleaning cloth. Buy Prada VPR 56U glasses online at a friendly price. Originally made in 2017, Prada PR 56UV are lightweight metal frames. Each pair of authentic Prada glasses ships worldwide with authenticity certificate, Prada box, case and a cleaning cloth. Buy Prada VPR 55U glasses online at a friendly price. Originally made in 2017, Prada PR 55UV are lightweight metal frames. Each pair of authentic Prada glasses ships worldwide with authenticity certificate, Prada box, case and a cleaning cloth. Buy Prada VPR 54U glasses online at a friendly price. Originally made in 2017, Prada PR 54UV are lightweight metal frames. Each pair of authentic Prada glasses ships worldwide with authenticity certificate, Prada box, case and a cleaning cloth. Buy Prada VPR 53U glasses online at a friendly price. Originally made in 2017, Prada PR 53UV are lightweight metal frames. Each pair of authentic Prada glasses ships worldwide with authenticity certificate, Prada box, case and a cleaning cloth. Buy Prada VPR 12UF glasses online at a friendly price. Originally made in 2017, Prada PR 12UVF are lightweight plastic frames. Each pair of authentic Prada glasses ships worldwide with authenticity certificate, Prada box, case and a cleaning cloth. Buy Prada VPR 12U glasses online at a friendly price. Originally made in 2017, Prada PR 12UV are lightweight plastic frames. Each pair of authentic Prada glasses ships worldwide with authenticity certificate, Prada box, case and a cleaning cloth. Buy Prada VPR 11U glasses online at a friendly price. Originally made in 2017, Prada PR 11UV are lightweight plastic frames. Each pair of authentic Prada glasses ships worldwide with authenticity certificate, Prada box, case and a cleaning cloth. Buy Prada VPR 10UF glasses online at a friendly price. Originally made in 2017, Prada PR 10UVF are lightweight plastic frames. Each pair of authentic Prada glasses ships worldwide with authenticity certificate, Prada box, case and a cleaning cloth. Buy Prada VPR 10U glasses online at a friendly price. Originally made in 2017, Prada PR 10UV are lightweight plastic frames. Each pair of authentic Prada glasses ships worldwide with authenticity certificate, Prada box, case and a cleaning cloth. Buy Prada VPR 09UF glasses online at a friendly price. Originally made in 2017, Prada PR 09UVF are lightweight plastic frames. Each pair of authentic Prada glasses ships worldwide with authenticity certificate, Prada box, case and a cleaning cloth. Buy Prada VPR 09U glasses online at a friendly price. Originally made in 2017, Prada PR 09UV are lightweight plastic frames. Each pair of authentic Prada glasses ships worldwide with authenticity certificate, Prada box, case and a cleaning cloth. Buy Prada VPR 08U glasses online at a friendly price. Originally made in 2017, Prada PR 08UV are lightweight plastic frames. Each pair of authentic Prada glasses ships worldwide with authenticity certificate, Prada box, case and a cleaning cloth. Buy Prada VPR 07UF glasses online at a friendly price. Originally made in 2017, Prada PR 07UVF are lightweight plastic frames. Each pair of authentic Prada glasses ships worldwide with authenticity certificate, Prada box, case and a cleaning cloth. Buy Prada VPR 07U glasses online at a friendly price. Originally made in 2017, Prada PR 07UV are lightweight plastic frames. Each pair of authentic Prada glasses ships worldwide with authenticity certificate, Prada box, case and a cleaning cloth. Buy Prada VPR 06UF glasses online at a friendly price. Originally made in 2017, Prada PR 06UVF are lightweight plastic frames. Each pair of authentic Prada glasses ships worldwide with authenticity certificate, Prada box, case and a cleaning cloth. Buy Prada VPR 06U glasses online at a friendly price. Originally made in 2017, Prada PR 06UV are lightweight plastic frames. Each pair of authentic Prada glasses ships worldwide with authenticity certificate, Prada box, case and a cleaning cloth. Buy Prada VPR 05UF glasses online at a friendly price. Originally made in 2017, Prada PR 05UVF are lightweight plastic frames. Each pair of authentic Prada glasses ships worldwide with authenticity certificate, Prada box, case and a cleaning cloth. Buy Prada VPR 05U glasses online at a friendly price. Originally made in 2017, Prada PR 05UV are lightweight plastic frames. Each pair of authentic Prada glasses ships worldwide with authenticity certificate, Prada box, case and a cleaning cloth. Buy Prada VPR 04UF glasses online at a friendly price. Originally made in 2017, Prada PR 04UVF are lightweight plastic frames. Each pair of authentic Prada glasses ships worldwide with authenticity certificate, Prada box, case and a cleaning cloth. Buy Prada VPR 04U glasses online at a friendly price. Originally made in 2017, Prada PR 04UV are lightweight plastic frames. Each pair of authentic Prada glasses ships worldwide with authenticity certificate, Prada box, case and a cleaning cloth. Buy Prada VPR 04P glasses online at a friendly price. Originally made in 2017, Prada PR 04PV are lightweight plastic frames. Each pair of authentic Prada glasses ships worldwide with authenticity certificate, Prada box, case and a cleaning cloth. Buy Prada VPR 03U glasses online at a friendly price. Originally made in 2017, Prada PR 03UV are lightweight plastic frames. Each pair of authentic Prada glasses ships worldwide with authenticity certificate, Prada box, case and a cleaning cloth. Buy Prada VPR 02UF glasses online at a friendly price. Originally made in 2017, VPR 02UF are lightweight plastic frames. Each pair of authentic Prada glasses ships worldwide with authenticity certificate, Prada box, case and a cleaning cloth. Buy Prada VPR 02U glasses online at a friendly price. Originally made in 2017, VPR 02U are lightweight plastic frames. Each pair of authentic Prada glasses ships worldwide with authenticity certificate, Prada box, case and a cleaning cloth. Buy Prada VPR 01UF glasses online at a friendly price. Originally made in 2017, VPR 01UF are lightweight plastic frames. Each pair of authentic Prada glasses ships worldwide with authenticity certificate, Prada box, case and a cleaning cloth. Buy Prada VPR 01U glasses online at a friendly price. Originally made in 2017, VPR 01U are lightweight plastic frames. Each pair of authentic Prada glasses ships worldwide with authenticity certificate, Prada box, case and a cleaning cloth. Buy Prada VPR 63T glasses online at a friendly price. Originally made in 2017, Prada PR 63TV are lightweight metal frames. Each pair of authentic Prada glasses ships worldwide with authenticity certificate, Prada box, case and a cleaning cloth. Buy Prada VPR 17TF glasses online at a friendly price. Originally made in 2017, Prada PR 17TVF are lightweight plastic frames. Each pair of authentic Prada glasses ships worldwide with authenticity certificate, Prada box, case and a cleaning cloth. Buy Prada VPR 17T glasses online at a friendly price. Originally made in 2017, Prada PR 17TV are lightweight plastic frames. Each pair of authentic Prada glasses ships worldwide with authenticity certificate, Prada box, case and a cleaning cloth. Buy Prada VPR 16TF glasses online at a friendly price. Originally made in 2017, Prada PR 16TVF are lightweight plastic frames. Each pair of authentic Prada glasses ships worldwide with authenticity certificate, Prada box, case and a cleaning cloth. Buy Prada VPR 16T glasses online at a friendly price. Originally made in 2017, Prada PR 16TV are lightweight plastic frames. Each pair of authentic Prada glasses ships worldwide with authenticity certificate, Prada box, case and a cleaning cloth. Buy Prada VPR 18TF glasses online at a friendly price. Originally made in 2017, Prada PR 18TVF are lightweight plastic frames. Each pair of authentic Prada glasses ships worldwide with authenticity certificate, Prada box, case and a cleaning cloth. Buy Prada VPR 18T glasses online at a friendly price. Originally made in 2017, Prada PR 18TV are lightweight plastic frames. Each pair of authentic Prada glasses ships worldwide with authenticity certificate, Prada box, case and a cleaning cloth. Buy Prada VPR 62T glasses online at a friendly price. Originally made in 2016, VPR 62T are lightweight metal frames. Each pair of authentic Prada glasses ships worldwide with authenticity certificate, Prada box, case and a cleaning cloth. Buy Prada VPR 61T glasses online at a friendly price. Originally made in 2016, VPR 61T are lightweight metal frames. Each pair of authentic Prada glasses ships worldwide with authenticity certificate, Prada box, case and a cleaning cloth. Buy Prada VPR 60T glasses online at a friendly price. Originally made in 2016, VPR 60T are lightweight plastic frames. Each pair of authentic Prada glasses ships worldwide with authenticity certificate, Prada box, case and a cleaning cloth. Buy Prada VPR 15T glasses online at a friendly price. Originally made in 2016, VPR 15T are lightweight plastic frames. Each pair of authentic Prada glasses ships worldwide with authenticity certificate, Prada box, case and a cleaning cloth. Buy Prada VPR 14TF glasses online at a friendly price. Originally made in 2016, VPR 14TF are lightweight plastic frames. Each pair of authentic Prada glasses ships worldwide with authenticity certificate, Prada box, case and a cleaning cloth. Buy Prada VPR 14T glasses online at a friendly price. Originally made in 2016, VPR 14T are lightweight plastic frames. Each pair of authentic Prada glasses ships worldwide with authenticity certificate, Prada box, case and a cleaning cloth. Buy Prada VPR 13TF glasses online at a friendly price. Originally made in 2016, VPR 13TF are lightweight plastic frames. Each pair of authentic Prada glasses ships worldwide with authenticity certificate, Prada box, case and a cleaning cloth. Buy Prada VPR 13T glasses online at a friendly price. Originally made in 2016, VPR 13T are lightweight plastic frames. Each pair of authentic Prada glasses ships worldwide with authenticity certificate, Prada box, case and a cleaning cloth. Buy Prada VPR 11TF glasses online at a friendly price. Originally made in 2016, VPR 11TF are lightweight plastic frames. Each pair of authentic Prada glasses ships worldwide with authenticity certificate, Prada box, case and a cleaning cloth. Buy Prada VPR 09T glasses online at a friendly price. Originally made in 2016, VPR 09T are lightweight plastic frames. Each pair of authentic Prada glasses ships worldwide with authenticity certificate, Prada box, case and a cleaning cloth. Buy Prada VPR 07T glasses online at a friendly price. Originally made in 2016, VPR 07T are lightweight plastic frames. Each pair of authentic Prada glasses ships worldwide with authenticity certificate, Prada box, case and a cleaning cloth. Buy Prada VPR 55T glasses online at a friendly price. Originally made in 2016, VPR 55T are lightweight metal frames. Each pair of authentic Prada glasses ships worldwide with authenticity certificate, Prada box, case and a cleaning cloth. Buy Prada VPR 54T glasses online at a friendly price. Originally made in 2016, VPR 54T are lightweight metal frames. Each pair of authentic Prada glasses ships worldwide with authenticity certificate, Prada box, case and a cleaning cloth. Buy Prada VPR 53T glasses online at a friendly price. Originally made in 2016, VPR 53T are lightweight metal frames. Each pair of authentic Prada glasses ships worldwide with authenticity certificate, Prada box, case and a cleaning cloth. Buy Prada VPR 10T glasses online at a friendly price. Originally made in 2016, VPR 10T are lightweight plastic frames. Each pair of authentic Prada glasses ships worldwide with authenticity certificate, Prada box, case and a cleaning cloth. Buy Prada VPR 06T glasses online at a friendly price. Originally made in 2016, VPR 06T are lightweight plastic frames. Each pair of authentic Prada glasses ships worldwide with authenticity certificate, Prada box, case and a cleaning cloth. Buy Prada VPR 05T glasses online at a friendly price. Originally made in 2016, VPR 05T are lightweight plastic frames. Each pair of authentic Prada glasses ships worldwide with authenticity certificate, Prada box, case and a cleaning cloth. Buy Prada VPR 04T glasses online at a friendly price. Originally made in 2016, VPR 04T are lightweight plastic frames. Each pair of authentic Prada glasses ships worldwide with authenticity certificate, Prada box, case and a cleaning cloth. Buy Prada VPR 03T glasses online at a friendly price. Originally made in 2016, VPR 03T are lightweight plastic frames. Each pair of authentic Prada glasses ships worldwide with authenticity certificate, Prada box, case and a cleaning cloth.